In the wake of last year’s election, a humiliated press corps was forced to reassess, to explain how it had gotten the presidential race so monumentally wrong. Conclusions: It had been too blinded by its own biases, too sheltered from Middle America. It apologized. It promised to do better. To read all this coverage, you’d be justified in believing that the entire Republican Party had been hit with a stupid stick. Its members united to jack up the taxes of millions of middle-income voters, throw the country into recession, and saddle today’s toddlers with a future debt crisis—all to enable the transfer of tax plunder to fat-cat donors. And not only did it pass this colossally idiotic policy, it did so enthusiastically, in full view of the public—guaranteeing a 2018 GOP midterm wipeout. What dimwits! This is the Democratic line, and the media is embracing it. Chuck Schumer and Nancy Pelosi bet that the GOP would fail to enact tax reform, so they pressed their members to boycott negotiations. Instead, Republicans are delivering bigger paychecks and the prospect of accelerated economic growth, and not a single Democrat can take credit. The Democratic Party’s only path is therefore to spin an obvious GOP victory into a disaster. The press, with all its biases and insularity, once again is all in, with another attack on reality. 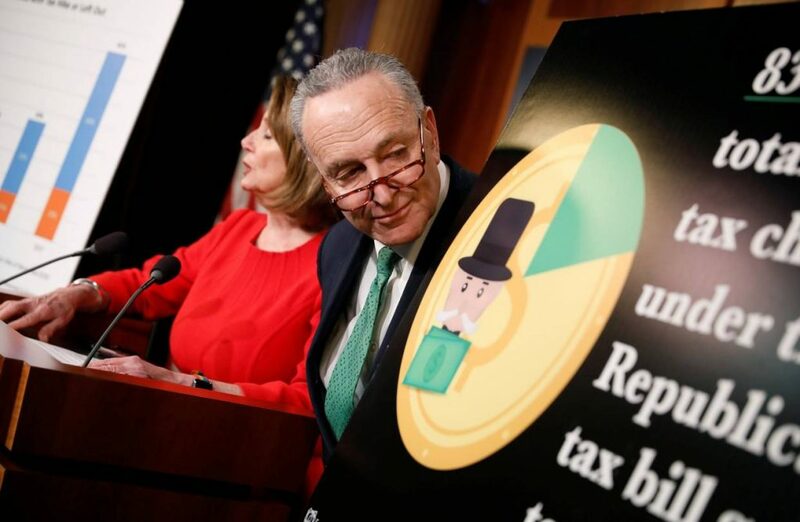 Nearly every story quotes a variation of Mrs. Pelosi’s line that the bill is “wholesale robbery of the middle class.” Mr. Schumer continues to claim the reform helps “only the wealthiest few.” These are Trumpian-size whoppers, which the media eagerly repeats. Yet even the liberal Tax Policy Center has acknowledged that 90% of the middle class will get a tax cut in 2018, and that the average cut will be $1,600. USA Today was so desperate to depict the bill as a tax hike that its analysis of “5 household situations” included a childless single renter earning $1 million a year, paying $50,000 in state and local taxes, and claiming $40,000 in charitable deductions. The paper triumphantly pointed out that this downtrodden soul would pay $1,887 more in taxes. And therefore have to forgo a bottle of Chateau Lafite-Rothschild. Democrats spent months insisting that corporations would pocket their tax cuts rather than invest in their workers. The press continues to parrot this line—even as AT&T, Comcast, Wells Fargo and others immediately announced bonuses, pay hikes, higher starting wages, better benefits and plans for new hiring. Democrats call these PR stunts, but so what? Workers are benefiting. The left and the press claim the bill—which abolishes ObamaCare’s individual mandate starting in 2019—will throw 13 million people off health care. They don’t seem to know any of the millions of Americans who will be relieved from paying a tax that can run more than $2,000 a family for being uninsured. The left and the press belittle the average cut as “only” $100 a month. They are out of touch with millions of solidly middle-income Americans who follow tight budgets. A hundred dollars can be enough for piano lessons, a family night out or new winter coats. The left and the press are suggesting the reform will primarily benefit Donald Trump’s empire—as if the Republican caucus, including Sens. Jeff Flake and Ben Sasse, love Mr. Trump so much that they were willing to spend all fall on a bill for his personal enrichment. They are running with these upside-down-world stories because so far they’ve gotten away with it. The tax bill has been but a theoretical proposition up to now, defined by press coverage. A recent Monmouth poll showed that 50% of Americans think their taxes will go up under this reform (the actual proportion is estimated at 5%). No wonder approximately 50% of Americans disapprove of the reform. The left and its media enablers got away with their Hillary fictions, too—until they had to report Donald Trump’s victory. The risk for the GOP here is that the early impression that this tax cut is “bad” could remain stuck in American minds. Then again, those $1,000 AT&T and Comcast bonuses—destined for hundreds of thousands of workers—are quite real. By February, the Internal Revenue Service should have recalculated its withholding formulas so millions of workers will be taking home larger paychecks. In the months that follow, the country should begin to see the early benefits of new U.S. investment—in jobs, benefits, and opportunity. Whatever happens, the anti-tax-reform campaign is a reminder to Republicans of the unprecedented hostility they face in the age of Trump. The best way to triumph in this war of spin is to produce real policy results that help real people—as they just did with tax reform, no matter what you read to the contrary.